Your Samsung Galaxy tablet keeps constant, accurate track of the time, which is displayed at the top of the Home screen as well as on the lock screen. The display is lovely and informative, but it can’t actually wake you up. You need to choose a specific time and apply a noise to that time. This process turns the tablet into an alarm clock. 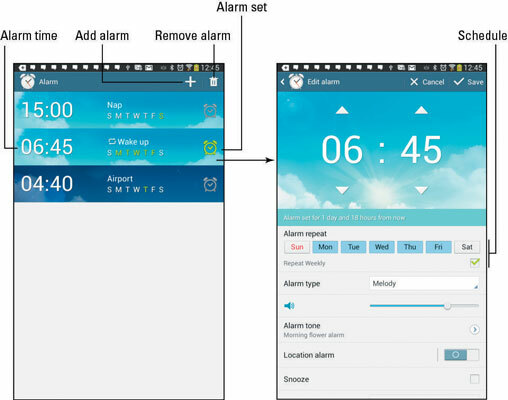 Alarm clock duties are the responsibility of the Alarm app, which you’ll find on the Apps screen. Its main screen looks similar to what’s shown on the left. The right side shows the alarm creation and editing screen. You create alarms for the Alarm app by touching the Add (+) icon. Use the next screen to edit details about the alarm. Set the schedule, sound, name, and other details that appear on the screen. The most important thing to set is the date and time. Touch the Save button to save the alarm. As an example, to set an alarm that wakes you up at 6:45 every morning, touch the day icons, Mon through Fri, and then place a check mark by Repeat Weekly. Scroll down to the bottom of the screen and type a name, such as “Get Outta Bed.” Touch the Save button and the alarm is created and set. The alarm you create appears on the Alarm app’s screen, left. Any new alarm you create is automatically set — it goes off when the proper time approaches. To disable an alarm, touch the Alarm Set icon. Alarms must be set or else they don’t trigger. If you’ve turned off an alarm, remember to set it again; touch the Alarm Set icon. When an alarm is set, the tablet shows an Alarm status icon atop the screen. To remove an alarm, long-press it and choose the Delete command from the menu. The alarm is deleted. The alarm doesn’t work when you turn off the tablet. The alarm does work, however, when the tablet is locked. The Location Alarm feature, found on the Create Alarm and Edit Alarm screens, can be used to disable the alarm when you’re at or near certain places. Touch the button to activate that feature, and then use the map to specify a location. As long as you’re at that location, the alarm will not go off. Consider getting a docking station so you can use your tablet as a nighttime music station and clock. The tablet makes an excellent bedside clock. It functions even better as a bedside clock when you activate the Blocking Mode feature, which allows you to set a time of day when notifications and alarms can be disabled or silenced. To access the Blocking Mode feature, open the Settings app. Choose Blocking Mode from the left side of the screen to activate that feature. (If you can’t find it, touch the Device category atop the screen.) On the right side of the screen, select which items you want blocked, such as notifications or alarms. You can set the specific times that Blocking Mode is active in the Set Time area. Remember that Blocking Mode does stifle any alarms you’ve set. So if you really need to be up by 4:00 AM, disable Blocking Mode so that you’ll hear that alarm.